Përmet is a small city in southern Albania, situated along the Vjosa River in a beautiful valley that leads to the Fir of Hotova National Park, famous for its forests, canyons, ancient Ottoman bridges and Orthodox monasteries. Despite the region’s riches, the Permet District remains one of Albania’s marginal areas today, cut off from the main lines of development and affected by high emigration. In addition to Përmet’s natural assets, the region is home to many largely forgotten gastronomic treasures. It produces fine white wines (from white debine grapes), raki (a fruit brandy found throughout the Balkans), honey and dairy products (such as white cheeses and salted sheep butter). 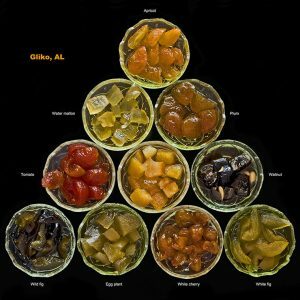 The region is also known for its warm hospitality, and anyone who has the fortune to be invited into a local home will immediately be offered gliko, a compote made from whole fruit similar to the slatko found in Slavic-speaking areas of the Balkans. Gliko is an important element of the local cuisine in Përmet and is made from many different fruits and vegetables, all grown locally by many of the valley’s small-scale farmers. ‘Walnut husk’ gliko, made from whole green walnuts, is the most common style and other popular variations include white cherry, eggplant, wild fig, plum and apricot. The production method, although differing depending on the type of gliko, involves the careful selection of the fruit, which is then left to soak for one hour and twenty minutes in a mix of cold water and lime so that it becomes firm and resistant. The fruit is then mixed with sugar and boiled in a traditional copper pot placed over an open flame, to cook for one hour. Lemon is added at intervals to maintain a bright color. When the fruit has absorbed the syrup the gliko is cooled and packaged in glass jars. Today, many families living in Permet continue to make gliko at home, offering it to guests and on special occasions. However, just three families are turning this tradition into a professional enterprise. The production of gliko could become a resource for the development of the local economy. However, the lack of adequate marketing of gliko’s qualities has exposed it to competition from industrial counterparts, made in other regions of southern Albania, which are sold with the same name and are usually cheaper. Slow Food will work with producers (and orchard owners) to: establish which local fruit varieties are best suited to the production of gliko; improve product quality and packaging; and promote gliko on the national and international market, making it a tool for preserving the biodiversity of the Vjosa Valley. Eftali Qerimi and Odeta Nasi, owners of Almeg farm, which employs more than 20 local women in the production of artisan gliko.